Pudge Kleinkauf has been fly fishing for arctic grayling for thirty years. As a professional guide she understands these fish and knows what it takes to find and hook up with the trophies. Listen in to hear her secrets to catching these beautiful fish. Every fly fisher has their favorite aquatic pick. For retired University professor and lawyer Pudge Kleinkauf that pick is an easy one. This long time fly fisher’s number one choice would be the arctic grayling. Pudge certainly knows a thing or two about fly fishing. 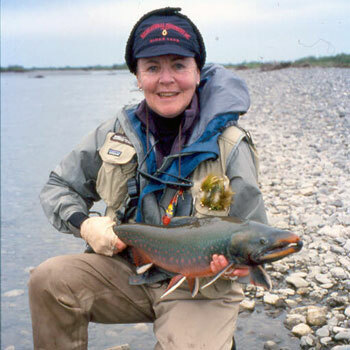 She’s been the owner and operator of Women’s Fly Fishing tours for over twenty years and can hold her own with her fly fisher male counterparts. Although she’s fished the world over, Alaska and the arctic grayling will always call Pudge home. One of the reasons why the grayling holds so much appeal to fly fishers like Pudge is the unique aspect of the fish. “It’s a fish that you must really see to appreciate and you must see it underwater with the light glinting on its scales to really understand what it is that is so breathtakingly beautiful about this fish,” Pudge explains. If you’re fortunate to spot a grayling in the right conditions, you’ll notice first its distinct coloring. Typically this is a serene aqua shade which can often glint into a purple coloring. The grayling has an outside dorsal fin. Their scales are cycloid in shape which creates those amazing light refractions. As for the fins, no two are the same. They are position high and stretch out long and pointed. In fact, some of these fins are so elongated that they can droop over the front of the body. Unless, of course, the grayling is getting frisky. During the courting periods, these fins are raised to its full height representing a kind of fish sail. Then there are the characteristic grayling spots. Think of these spots as the grayling’s version of fingerprints. Like the fins, you’re not going to find two sets of spots alike. Pudge thinks that the grayling is the perfect fish for a 5-weight rod. Although they will put up a good struggle for their size, they remain a very cooperative fish. They are also a very slow growing fish. A recent tag captured grayling revealed that it was over 30 years old and just 18 inches long. The typical grayling will grow to between 12 and 15 inches. As for their perfect water environment, the more chill the better. Anything over 60 degrees and the grayling becomes a ghost. To attract a grayling just think bugs. As Pudge describes, “They love bugs, they just love bugs and they love all stages of bugs, so you can fish them with emergers. They love nymphs, dry flies, yes so they’re clearly primarily insectivores.” That doesn’t mean Pudge won’t step out of her safe zone and try out other types of flies. She has even had success with a mouse pattern catching monster grayling. If push comes to shove, Pudge would be happy having a Gold-Ribbed Hare’s Ear as her only fly. Seems as though the graylings just can’t resist that one! As for where to find the Arctic Grayling, the word “Arctic” is a big clue! Think Alaska and Canada. The streams around Alaska’s Bristol Bay are chock full of the graylings. You’ll also find fertile fishing grounds along the Togiak River, Seward Peninsula, Kotzebue, Nome, and Unalakleet Rivers. Down in the lower 48, if you come across a grayling chances are it has been introduced into those waters as opposed to being naturally indigenous. If you’re stuck for finding a perfect spot, Pudge recommends calling up your local Department of Fish and Game. Ask for the Sportfish Division and let them know you’re on the prowl for a grayling. They’ll point you in the right direction for sure!